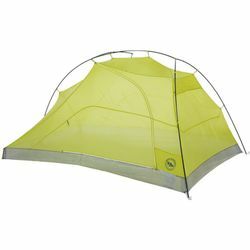 Big Agnes Tiger Wall 3 Carbon Tent. If you could snap your fingers and the lightest, most packable two-door tent of your dreams would appear before you, this would be it. Designed with the lightest-weight materials available; Easton® carbon pole set and Dyneema® fabric - an extremely strong and dynamic fiber that is both highly tear resistant as well as fully waterproof. This tent is any ultralight-weight traveler's dream. These products are intended for only the most advanced user. Although extremely strong for their weight, these tents are not indestructible and require careful use to decrease the possibility of damage. Special care during setup and extended trips is important as rough handling, long-term abrasion, exposure to sharp objects or rocky campsite selection may result in fabric punctures and tears. We highly recommend using tent footprints with these tents to improve durability. Self-adhesive repair patches are included in the event that repairs must be made on the trail. Big Agnes took the Tiger Wall tent and built it using Easton® carbon fiber poles and Dyneema® fiber-based fabrics to create the ultimate two-door, free-standing tent, engineered to handle the elements like no other tent on earth. Dyneema® fiber-based fabric is respected as the premium brand for Ultra-High Molecular Weight Polyethylene. This fabric is ultralight weight, 100% rainproof and has a high dimensional stability that resists stretching or sagging during temperature changes. Its unique structure creates a fabric with extremely high tear-strength and allows for welded construction, which eliminates seams and the need for seam tape, enhancing its durability and waterproofness.